Commerce Content is independent of Editorial and Advertising, and if you buy something through our posts, The A.V. Club and Gizmodo Media Group may get a small share of the sale. Click here to learn more. 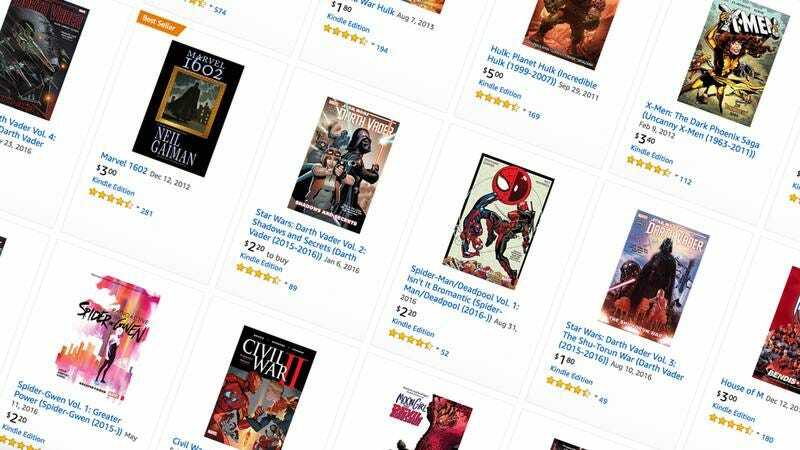 Amazon’s running a Marvel digital comic sale that’s bigger than any Avengers movie today, with literally thousands of titles marked down to $5 or less. You’ll find everything from the Guardians Of The Galaxy to Darth Vader to Deadpool to Captain America in there, and every hero in between, so there’s never been a better time to stock your digital shelves. The selection is overwhelming (nearly 400 pages! ), so if you have any specific suggestions, drop them in the comments. There are probably thousands of Apple Watch charging stands out there, but basically every one I’ve seen shares the same problem: They slide all over your nightstand when you try to pull the watch off its magnetic charger. Aukey seems to have solved that with an ingeniously simple suction cup on the bottom of its stand. It’s a little thing, but you’ll appreciate it every night, and what’s $6 to someone who spent hundreds of dollars on an Apple Watch? Note: This doesn’t include any actual charging hardware: Like most Apple Watch charging stands, it’s basically just housing for the included charger. Amazon’s back at it again with another great sample box, this time with seven premium beverages for $10, plus a $10 credit on your next eligible beverage purchase on Amazon. If you’ve ever been curious to try Soylent, this is your moment. I know you don’t need an electric jar opener. You possess impressive finger strength and well developed forearm muscles, and no jar could hope to best you. But maybe it could do, say, your parents or grandparents some good, and it’d be a nice gift at $19, today only. If you’ve ever eaten at a nice steakhouse, you were probably eating sous-vide meat. Here’s a secret though: It’s really easy to get those kinds of results yourself, and Amazon’s here to help with another $109 deal on the Anova Bluetooth sous-vide circulator. Lifehacker has a great explainer on sous-vide cooking for you to check out, but the basic idea is that you seal the food in plastic bags, and then cook it in precisely heated water over a longer period of time. It sounds weird and kind of sterile, but the result is meat that’s cooked to the exact right temperature all the way through. Golfing gear is about as stereotypical as Father’s Day gifts can get, but this Callaway home range practice system actually looks really cool. $113 gets you a net, a hitting mat, and a caddy/feeder that can hold 35 balls and drop them onto the hitting zone with a tap of a club. With a few short-lived exceptions, this is the best price Amazon’s ever listed, so tee off on this deal before it sells out.